(Bloomberg) -- Chinese equities are now so cheap that even the Shanghai Stock Exchange feels compelled to say something about them. Optimism over corporate health persists despite a rout that shaved more than $2 trillion off the value of Chinese equities since a peak in January, taking valuations to two-year lows. Analysts predict companies on the CSI 300 Index, which mostly sell in China and are less affected by a weaker yuan, will increase profits by 16 percent on average in 2018, according to data compiled by Bloomberg. That would be their best earnings growth in eight years. This evidence of China Inc.’s resilience may offer relief to investors after a selloff turned the country’s stocks into the world’s worst performers. Tightening credit conditions and a trade dispute with the U.S. pose risks to an economy that’s already set to expand at the slowest pace since 1990. Goldman Sachs strategists say China will deliver the best earnings growth among countries in their Asia Pacific ex-Japan coverage this year, helped by a rebound in the energy and materials companies that together make up about a 10th of the CSI 300. While commodities took a beating in June, their average price in the second quarter was still 7.2 percent higher than the same period last year, according to a Bloomberg index. China’s largest insurers have also helped bolster prospects for profit growth, amid signs their shift into longer-term products is paying off despite tougher regulation. Analysts have lifted their earnings-per-share estimates for Ping An Insurance (Group) Co., the biggest stock on the CSI 300, to an all-time high. Not everyone is convinced that earnings will be so good in China, or that a stronger fundamental backdrop will lift the country’s equities. Morgan Stanley strategists cut their forecasts last month, predicting only about 9 percent profit growth for CSI 300 members in 2018, down from a previous estimate of 12 percent. They also forecast the index is unlikely to recover from a bear market in the next year. 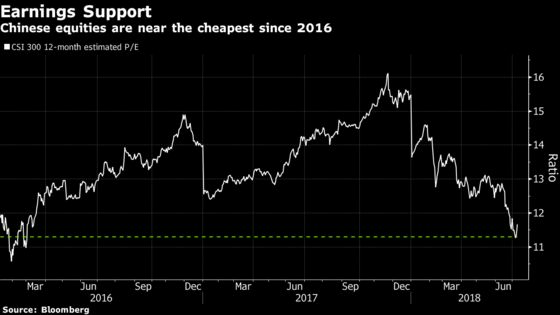 With the second-quarter reporting season about to kick off, expectations that earnings will jump have made Chinese stocks about 25 percent cheaper than in January. They also trade at a 5.5 percent discount to the MSCI Emerging Markets Index, near the widest since 2014. The low valuations attracted some dip buyers back into the equity market Monday, when the CSI 300 rose 2.8 percent for its best daily rally since August 2016. It added 0.2 percent Tuesday, its first three-day winning streak in two months. “You have stocks that are trading below their intrinsic value,” said Eleanor Creagh, a Sydney-based market strategist for Saxo Capital Markets. That means there are opportunities in some sectors like consumer and tech, though “investors have to be cautious at the moment,” she said.